In Star Wars: Armada, you command the unmatched power of the Imperial fleet, or gain the opportunity to prove your tactical acumen as an admiral in the Rebel Alliance. Massive Star Destroyers fly to battle against Rebel corvettes and frigates. Banks of turbolasers unleash torrential volleys of fire against squadrons of X-wings and TIEs. Assemble your fleet, survey your objectives, form your battle plan, plot your course, call your shots, and destroy the enemy. 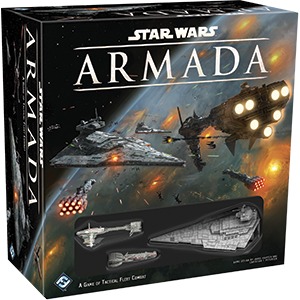 Armada balances the awesome scale of the Star Wars galaxy’s ships and space warfare with ship designs and rules that make for accessible, intuitive play experiences. It’s your job to issue the tactical commands that will decide the course of battle and, perhaps, the fate of the galaxy. The Star Wars: Armada Core Set contains everything you need to get started, including the rules, an articulated maneuver tool, a range ruler, six command dials, nine attack dice, ten unpainted squadrons, and three pre-painted ship miniatures (Victory-class Star Destroyer, Nebulon-B frigate, CR90 Corellian corvette), plus more than 130 cards and tokens.